Many silent films are early adaptations of material later made iconic in the sound era. It was silent cinema that first gave us The Ten Commandments and Cleopatra; The Great Train Robbery; Hamlet; Robin Hood, and The Thief of Baghdad. Nosferatu preceded Dracula by nine years, while there were two versions of The Wizard of Oz before Judy Garland donned her ruby slippers in 1939. Now, comparing a silent film to its sound remake isn’t a wise use of time if one is only interested in judging absolute quality—silent and sound films face different challenges in telling a story. But it is worthwhile, and enlightening, to compare films that treat the same source material in different ways. Such is the case with Frankenstein. The original Frankenstein film has no castle, lightning storm or shrieks of ‘It’s alive!” (not even through an intertitle). No stitches, green skin, or bolts in the neck. Its Monster is a lumpen hulk, wild haired and sneering; conjured in a cauldron of boiling chemicals, just like Mary Shelley intended him to be. Actor Charles Ogle tries for none of the sympathy Boris Karloff would win for the character 21 years later. Instead, he’s a boogeyman—a direct product of Frankenstein’s hubris. Perhaps he’s not even real. That you can even debate the Monster’s realness says much for Frankenstein. Few films made in 1910 had much complexity at all, partly because they were so short. Frankenstein itself is less than 15 minutes long, and bears all the limitations of its period: intricate but theatrical sets; a fixed camera set at medium range; no dialogue; intertitles that describe the scene before it is shown. Audiences of the time still saw the moving picture as a spectacle unto itself; part of the entertainment was seeing a story they knew well portrayed in this unusual way. Frankenstein is more than a novelty, though. It speaks plainly of the catastrophes that result from bad intentions, and by never clarifying the reality of the Monster, it achieves something almost no film from that period could: subtlety. Instead of a perfect human being, the evil in Frankenstein’s mind creates a monster. This intertitle leads to the creation scene—a remarkable bit of special-effects that still works today (imagine tender meat falling on, rather than off, the bone). 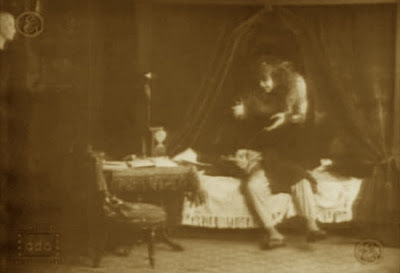 Upon being born, the Monster immediately attacks Frankenstein (Augustus Phillips), who faints upon his bed. The Monster then hovers over him for a moment, looking like a bad dream that’s still being dreamt. Does the simultaneous appearance of Frankenstein and the Monster confirm that the Monster exists? All we know is that it has been created by ‘the evil in Frankenstein’s mind.’ This could mean (a) the Monster is a by-product Frankenstein’s evil nature, i.e. a dream, hallucination or split personality, or (b) Frankenstein’s evilness prompted him to build a being of flesh and blood. Without proof to the contrary, most viewers will assume (b). But the matter proves very tricky. This Frankenstein has no Igor to help him—he works alone, and other than one, dubious exception, he is the only character who sees the Monster. We viewers see him all the time, of course. We witness the Monster following his creator home, confronting him in otherwise empty rooms, then hiding behind curtains when other characters appear. We are the only ones who see the Monster alone, as when he recoils before his own image in a full-length mirror. On the bridal night, Frankenstein’s better nature asserting itself. How are we to interpret this? We see the wedding guests departing the home, leaving only the new husband and wife. They embrace happily, and she precedes him to the bedroom (off-screen). He pauses, then walks off-screen in the opposite direction. The Monster now appears and skulks into the bedroom. Frankenstein returns and is nearly knocked down by the terrified Elizabeth as she flees the bedroom. She faints; Frankenstein and the Monster briefly struggle over her prone body. The Monster escapes. Elizabeth, it seems, has seen a Monster on her wedding night. The creation of an evil mind is overcome by love and disappears. Fleeing his creator, the Monster tries to hide in the room with the mirror. He is again horrified by his own appearance, but this time, he doesn’t shy from it. 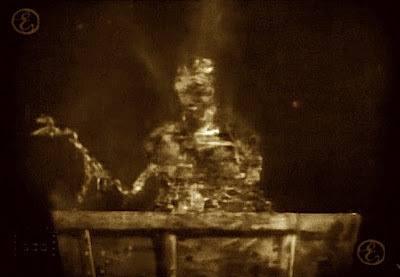 The Monster then disappears, but his reflection remains, as Frankenstein now enters the room. For a moment, Frankenstein’s reflection is the Monster’s, not his own. Only when the reflection of Frankenstein matches the man himself does Elizabeth appear and embrace him again. 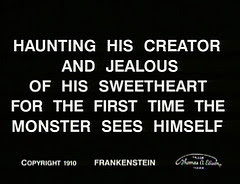 As different as Shelley’s novel is from the 1931 version of Frankenstein, they share an assumption that the Monster is real. The novel’s Monster embodies Frankenstein’s arrogance and folly—his flaws literally come back to haunt him. The 1931 film has the Monster interact with (and kill) so many people that his physical presence is undoubted. Only the silent version approaches it as pure abstraction. The Monster is lust. Hi, came across your site from the Siren's recent post. Very nice site. I will be posting a link from my site, Allure, that features actresses from the twenties and thirties, many whose career began or began and ended in silent films. Keep up the good work. Thanks for the link! I'll return the favour in a moment. Your site is a real beaut, which is appropriate. I love, love, love Clara Bow; 'It' will be gracing Silent Volume sooner than later. That was a nice essay on the movie. I remember when it was lost and all we had was the photo of Charles Ogle. Thanks for including links to where we can see this film. I really like the idea of the Frankenstein monster being the embodiment of lust or evil, rather than a lumbering, square-headed man. Great post!